A Message from Brandi Carlile and The Twins about LOAA! Hey guys! Just in case you are completely off the Facebook grid and missed this today - we're cross-posting the video message from Brandi Carlile and The Twins today about Looking Out Across America! We arrived back home from Brandi's shows at The Beacon Theater this weekend with a renewed excitement for what the Fight the Fear campaign and Looking Out Foundation are going to look like in 2013! We're so honored and humbled to be part of the ongoing efforts of the Looking Out Foundation, and thrilled to know some of the great people who lend their time and energy to championing the causes that the foundation supports. Alright...we have TWO Looking Out Across America T-shirts to give away this time! Two very generous LOAA supporters have purchased extra shirts to donate to a a couple lucky people in the still shirtless states! It's easy to enter using the giveaway box below - you can enter by letting us know what state you live in, and get another entry for "Liking" our Facebook page! The contest is only open to people living in the currently "LOAA shirtless" states - Delaware, Louisiana, South Dakota, West Virginia, Wyoming! Please donate if you can! All proceeds go to the Looking Out Foundation! Please reference "Looking Out Across America" or "LOAA" in the memo line! 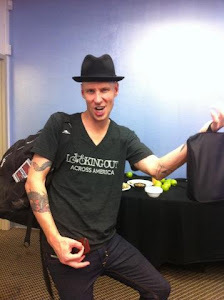 Look who was recently spotted sporting his Looking Out Across America T-Shirt! Lookin' good Tim!